Apron Plane – A small plane that will fit in a woodworkers apron. 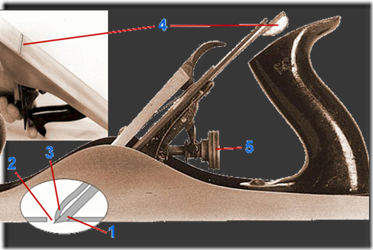 Bench Plane – Any one of the standard configurations of common planes, comprising (like the Stanley/Bailey #1-#8) the Smoother (or Smoothing) Plane, Jack Plane, Fore Plane (or Trying Plane) , and Jointer (or Jointer Plane). The main difference between one bench plane to another is the length of the sole. 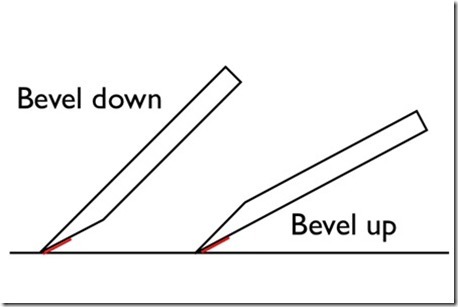 Bevel (sharpening edge tools) The surface formed by the abrasive sharpening of an edge tool. In the simplest case, that of a simple chisel or plane blade, the back and front of the cutting part of the tool are parallel, and the bevel is formed by removing material from the end of the tool at an acute angle to the back. A double bevel is used on some carving chisels, meaning material is taken from both sides. A turning scraper might have a curved bevel and a molding plane iron or shaper blade can have a curve with a complex bevel. Bevel Down A plane with the bevel down on the cutter. Blade Also see Iron and Cutter. The sharp part of the plane that does the actual cutting. Block Plane – The smallest of the common planes, sometimes considered one of the Bench Planes, because it, too, is usually kept by the bench and is in use sometimes even more than its Bench Plane cousins. However, the Bench Planes share a common configuration that the Block Plane does not follow. Its blade is held bevel-up. It lacks a chip breaker and has a simpler adjustment mechanism, without a movable frog. It is a light and handy plane that is used for any quick, small planing job, and is especially suited to trimming and smoothing end grain. The blade is held at an angle of about 20° to the work, but the bevel-up configuration means the bevel angle must be added to this to find the actual cutting angle at the wood surface. 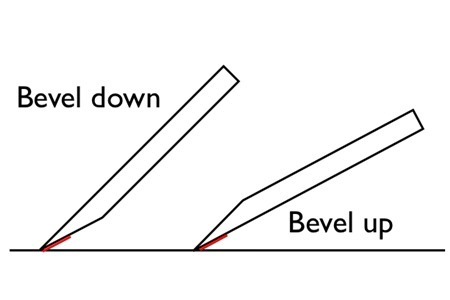 A standard 25-degree bevel makes the total angle 45°, the same as the bench planes. Low-angle models with a blade angle of about 12° are available, and some block planes can adjust the opening of the mouth by means of a movable section of the sole in front of the blade. Cutter Also see Iron and Blade. The sharp part of the plane that does the actual cutting. Fore Plane – A Bench Plane having about an 18″ sole. So named because it was used before the Jointer, to begin the preparation of a board. On relatively short boards, performs the service of a jointer, i.e., to make a true, straight edge. Hollow Grinding – In sharpening, leaving the bevel with the shape of the grinding wheel, that is, a slightly hollow, curved shape. This leaves little material to be removed when honing, until repeated re-honing has worn away the hollow, and the tool must be ground again. Honing the hollow-ground bevel produces a Microbevel. Infill Plane – true infill planes have a core of wood which is encased in a channel of steel, brass or bronze. This form of construction became popular around the early 1800’s, however the idea of a metal plane with a wooden core goes back at least 2000 years to the time of the Roman Empire. In fact ancient infill planes were discovered at Pompeii during the excavation of that city back in 1926. Iron Also see Blade and Cutter. The sharp part of the plane that does the actual cutting. 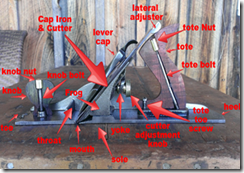 Jack Plane – A Bench Plane having about a 14″ sole. The “Jack of all trades” among bench planes. If a plane is needed for a job other than one of the specialized jobs of the other planes, this is the plane that is called for. To roughly take a millimeter odd the edge of a door, to beat a very rough edge into shape before using a jointer on it, and for many small or large jobs, the Jack is lighter and less tiring to use than the jointer, and can take a bigger bite than the light smooth plane by virtue of the momentum its weight provides. Jointer Plane – The longest of the Bench Planes, with about a 22-1/2″ sole, this heavy plane is used to provide a board with a straight, square edge. 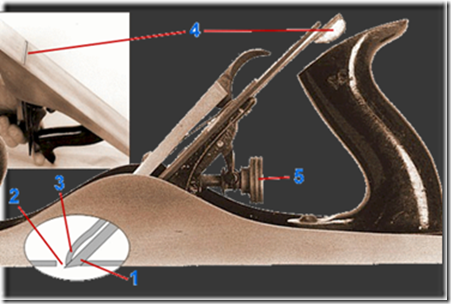 The long sole carries the blade over low spots in the surface, allowing it to cut only the high spots, until, finally, the job is done when the plane takes a single, unbroken curl of wood off the whole surface of the edge. Because of its weight, it is not used where a lot of material needs to be removed. The less tiring Jack or Fore Planes are used to rough down the high parts, and the Jointer then trues up the rough edge. Microbevel – In sharpening, adding a small additional bevel to the cutting edge at a steeper angle than the main bevel. This has several advantages, including strengthening the cutting edge at the very tip by making it thicker, and allowing resharpening of only a very small amount of material, i.e., only the microbevel need be sharpened. The combination of microbeveling and Hollow Grinding makes for a very easy resharpening procedure, with major sharpening only occasionally needed. Rabbet – Woodworking term. A groove along the edge of a board, i.e., a a groove that only has one side, the other side being off the edge of the board. May be on the long edge or on the end of the board. scrub plane – The scrub plane is a type of plane used to remove large amounts of wood from the surface of lumber, such as when eliminating cup or twist in the first stages of preparing rough stock, or when reducing the thickness of a board significantly. Scrub planes generally have a short sole, a relatively narrow but thick blade, a very wide mouth, and a deeply curved edge (of about a 3 inch radius) to make a deep, gouging cut. A scrub plane is generally used in diagonal strokes across the face of a board, rather than parallel to the length of the board (along the grain) as with most other bench planes. In thicknessing or preparing rough stock, the scrub plane is usually followed by the jack plane, jointer plane, then smoothing plane. Its function in modern woodworking has been largely replaced by power tools such as the thickness planer. A scrub plane can still be useful for planing boards too wide to fit through a thickness planer. Smoother, Smoothing Plane – The smallest of the Bench Planes. 9-3/2″ long. This plane is used for smoothing surfaces. Its short sole allows it to follow any wide dips in the surface, allowing it to evenly provide a clean-cut surface all over the board without having to level down every part of it. Because it is used on surfaces rather than edges, the cutting edge of a smooth plane is often given a very slight curve to keep the corners from digging in. Transitional Plane – A plane with a combination of a wooden body with a cast iron frame, frog and standard adjustment mechanism. . Trying Plane – An older term for a Jointer Plane or for the shortest of several planes that would now be referred to as Jointers.